WELCOME TO TWIN COUNTY CHORUS! Twin County Chorus of Long Island, New York welcomes women to sing with us. We rehearse every Thursday from 7:15 until about 9:45 pm in Levittown. 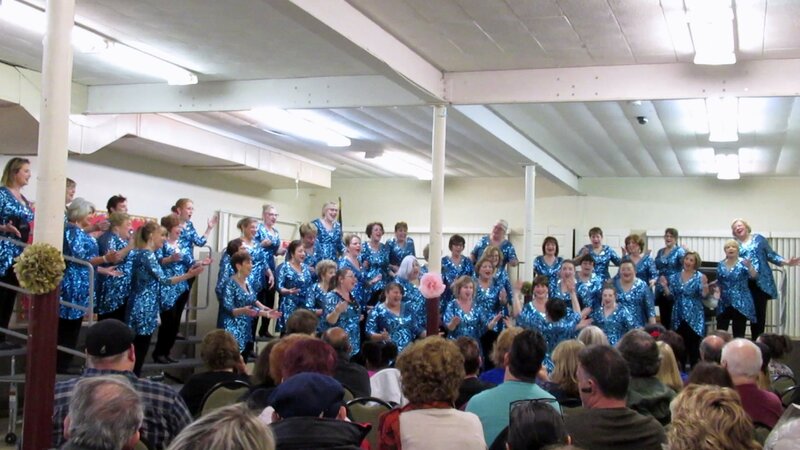 We are a great women's chorus to belong to, and a great group to entertain you! Tell us about your singing, and how Twin County Chorus has helped you expand your musical knowledge. I always loved singing when I was growing up, but I didn’t have singing experiences other than an occasional chorus event at school or karaoke with family and friends. Our chorus meets once a week, not just for fun (which it is), but to improve our singing. We all work hard for the rewarding moments when we create pure, warm, and multi-layered harmony that fills the rehearsal hall! Our former director, Connie, and our current director, Christine, challenged me to take on leadership roles in the chorus, but I didn’t think I could. Now, I’m in such a role, thanks to their support and encouragement. Also, you connect with all kinds of resources with Sweet Adelines International to learn any aspect of barbershop music. I’ve been singing barbershop for ten years . . . but I didn’t expect to do what I am doing now. Through musical education, we raise each other up every week. It’s a beautiful thing! Japanese culture is very different from American culture. Can you share with us how you learned that to be true? Yes, it’s quite different. May I say it’s the opposite? Because of that, when I switch languages, I not only translate what I want to say, but I change my attitude and mindset a bit. For example, Japanese apologize a lot; Japanese bow to show thankfulness. Also, to the Japanese, “silence is gold”. This saying exists in other cultures and languages, but it’s often followed by “speech is silver”. In Japan, silence is gold, period! We don’t value speech! But, you quickly learn that you can’t survive in the US with that attitude. The thing I love about the US is that Americans don’t set limits on themselves. Japanese follow the rules or expectations of what others think is correct. Behaviors are determined by age, title or place in society, gender, etc. I’m happy to be learning barbershop style singing and the whole American culture through Sweet Adelines International, and to add some cultural diversity to the organization as people get to know me! Tell us about your visit to a Sweet Adelines International chorus in your native Japan. I didn’t know there were Sweet Adelines International choruses in Japan until I joined the chorus here in the US, so it came as a shock! I try to visit them every time I go back to Japan. They sing all the songs in American English, but the talk between the director and the group is in Japanese. It’s a bit weird to hear barbershop music being discussed in my own language. It’s hard to explain – my brain gets confused a bit – I’m just happy to know there are people in Japan who love barbershop. Tell us something about yourself that might be surprising to your fellow Twin County Chorus sisters. Maybe my work? I work for a PR/research company and one of the hundreds of things I do (well, that's the life of small company, if you don't know!) is to follow the latest news in US healthcare: the complicated (and constantly changing!) regulations around Medicare or Medicaid, major pharma's drug research & development, medical research papers, and so on. I write articles and research reports, or give seminars to Japanese pharma companies, drug wholesalers or government organizations. I knew nothing when I started but it's a very interesting field. I enjoy what I do at work! What goal or goals are you currently pursuing? I do a lot of things around barbershop... arranging, directing, quartet singing... Somebody recently asked me, "So, what do you want to be after all?" Well, I want to be a better singer! My focus has always been on singing. Everything I do is for better singing! You are an Assistant Director and Quartet Coordinator for Twin County Chorus now. What advice would you give to someone who is considering joining a quartet? I really like this question! If you are considering a quartet, do it. Don’t wait for a better opportunity that might or might not come. When you meet the “right ones” to sing with, you should do it for the experience. You will only get better as you move forward. Thinking about it doesn’t count. If you realize it’s not going to work out, then move on. Just be respectful and openhearted to the others in the quartet always. Set your goal, then see what you need to do. Come prepared and be your very best at quartet rehearsals. Asuka, do you have any “super powers” – a fun or unusual talent – that you would like to share with us? If asked why I love Twin County Chorus, I would say because I “sensed” it, and knew I would. Yes, this is my superpower. At first glance, I “sensed” the person I would be with in a romantic relationship later. “Later” could be a few months, a year, or in one case, it took almost ten years. I trust my instincts for other things, too. That’s why I’m here in New York, singing barbershop! I had such a good sense about Twin County Chorus, and I knew right away it was the chorus I wanted to be in. Tell us about your pet, Muffin. Muffin is another thing barbershop brought me! Muffin was one of three cats a lady I sang with, in my other barbershop chorus, left behind when she passed away. I got a tiny kitten, 6 months old then. That was Muffin! She loves music - I mean, sitting on the sheet music and walking on the keyboard kind of love! She talks to us with lots of noise but barely says "meow." She speaks one Japanese word, "gohan," that means "meal"!! Necessity is the mother of studying language... I know that really well! Besides Barbershop and Muffin, what are some things that make you happy? Hmmm... Ice cream? Potato chips? Beer? Oh, my life would be empty if you took away barbershop and my cat! Our 4-part harmony, a cappella chorus invites you to sing with us Thursday nights. We rehearse on Thursday nights at 7:15 pm at the Good Shepherd Church (we rent space - we are not affiliated with the church). The address is 3434 Hempstead Turnpike (white church with steeple on the south side of the road), in Levittown, NY. Every time you shop at Amazon.com, the Amazon company will make a donation to our chorus, and it does not cost you a cent more to shop this way. 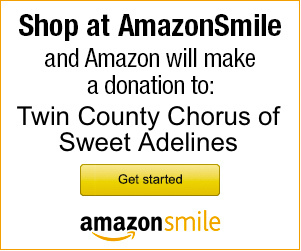 Please sign up for AmazonSmile, and name Twin County Chorus as your preferred charity.